247 Durand Street | SIREG Management Inc. 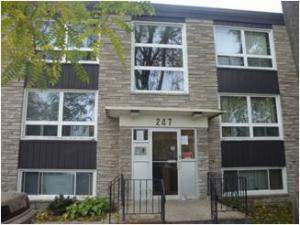 This clean, well maintained low rise apartment is quietly tucked away in a lovely, mature residential neighbourhood. This ideal location is close to downtown, and one block from major bus routes. Schools, parks, and the hospital are all within walking distance. Leases include Heat & Water, tenant pays for hydro/electricity. There is a secured entrance, laundry facilities onsite and storage lockers available. Units have new laminate flooring & are freshly painted. There are a small number of furnished, 1 bedroom units available for short term or long term rental. Rent is all inclusive for these units including cable & internet. Please inquire about current availability. Pet Friendly Policy: 2 small pets allowed, maximum combined weight MUST NOT EXCEED 50lbs. Comfortably furnished, ideal for short term rentals/professionals! Monthly rent is all inclusive for these furnished units and includes cable, internet & 1 parking space. Call to inquire about availability as there are a small number of available furnished units.